Location: Mary Chapel of the National Shrine of Our Lady of the Snows, Belleville, Illinois. The devotion to Mary under the title of Our Lady of the Snows is the oldest devotion to Mary in the Catholic Church, and can be traced to Rome in the year 352 AD. The legend tells of how, at the height of the Roman summer, snow fell during the night on the summit of the Esquiline Hill. A Roman patrician John and his wife, in obedience to a vision of the Virgin Mary that they had the same night, built a basilica in honour of Mary on the very spot that was covered with snow. 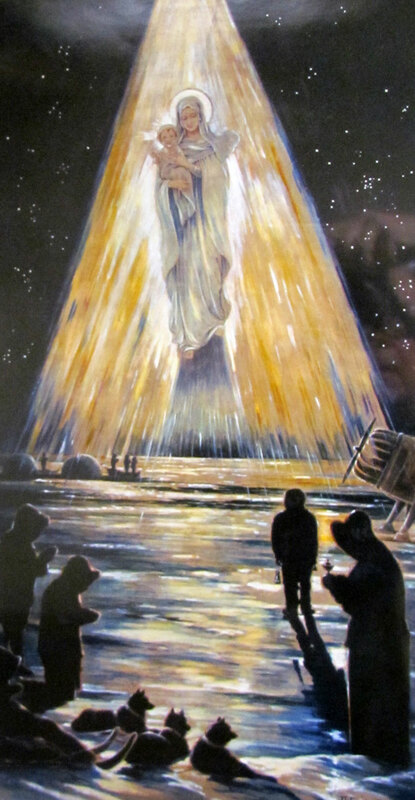 The devotion to Our Lady of the Snows was first introduced to the US midwest in 1941 by Fr. Paul Schulte of the Missionary Oblates of Mary Immaculate. In the 1940s, Davis painted a version of Our Lady of the Snows for St. Henry's Seminary in Belleville, Illinois. Sources are unclear as to whether Davis was commissioned to complete the painting or asked as a personal favor; but he was acquainted with Father Paul Schulte, O.M.I., a German immigrant known as the "flying priest of the Arctic," for personally flying a plane to reach peoples of northern Canada and Alaska with his missionary and medical work. 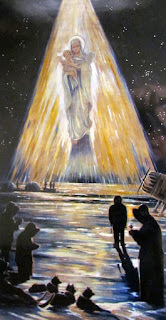 In this painting Davis has elevated Mother and Child above the surrounding figures in a vertical composition, in which the vision emanates from the Northern Lights; Fr. Schulte's plane appears as an element in the painting. John Watson Davis (1870 - 1959) was an American illustrator whose career spanned six decades. In addition to his religious commissions, his drawings appeared in Zane Grey novels, in editions of Sherlock Holmes tales and Bluebeard, and in other books and magazines. Born in New York, Davis moved with his family to Paris when he was ten years old, where he received his art training. Davis returned to Brooklyn when he was in his twenties, and began his commercial artist career. To avoid confusion with other artists named "John W. Davis," he began signing his work "J. Watson Davis."